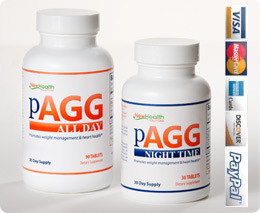 Free pAGG Program™ download - Your 20 page quickstart guide to being successful with pAGG. Includes: meal and exercise guidelines, recipe links, and goal tracking tools. Free Four Hour Chef when you subscribe! Attention! We may not ship to your country. We have shipped to: Canada, Australia, UK, Belgium, Hungary, Denmark, Netherlands, Norway, New Zealand, Japan, Taiwan, Mauritius, UAE and more without issues. We no longer accept orders from Germany due to customs restrictions. If your country is not listed here, please contact us to verify our product meets your country's customs requirement. Customs charges are highly variable and cannot be predicted in our experience. Only in a few cases has a fee of $5-15 USD been charged by customs upon delivery but exceptions to this range are possible. Customs charges, if any, will be the responsibility of the customer. If your order arrives and the customs charge is unreasonable, you may return the package for refund less shipping and handling. For MasterCard, Visa or Discover, it's the last three digits in the signature area on the back of your card. For American Express, it's the four digits on the front of the card. Total: $ Please select a shipping option.